Hopelessly Devoted Bibliophile: Win a copy of ONCE by Anna Carey! 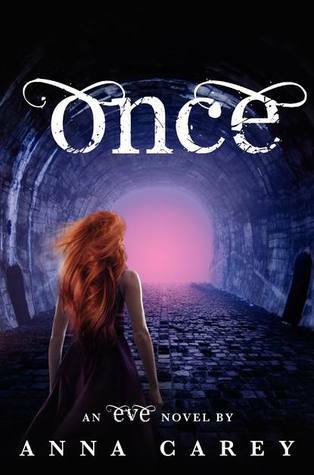 Win a copy of ONCE by Anna Carey! Ready to win one of the most anticipated books of the year? If you are a fan of Anna Carey's Eve, you'll love the second installment. Eve is back in Once. When you're being hunted, who can you trust? For the first time since she escaped from her school many months ago, Eve can sleep soundly. She's living in Califia, a haven for women, protected from the terrifying fate that awaits orphaned girls in The New America. But her safety came at a price: She was forced to abandon Caleb, the boy she loves, wounded and alone at the city gates. When Eve gets word that Caleb is in trouble, she sets out into the wild again to rescue him, only to be captured and brought to the City of Sand, the capital of The New America. Trapped inside the City walls, Eve uncovers a shocking secret about her past--and is forced to confront the harsh reality of her future. When she discovers Caleb is alive, Eve attempts to flee her prison so they can be together--but the consequences could be deadly. She must make a desperate choice to save the ones she loves . . . or risk losing Caleb forever. Thanks to Harper Collins, I am able to provide you lovely people with a chance to win a copy of this book! Isn't that fabulous? To enter, fill out the Rafflecopter form below. You must be a resident of the U.S. to enter, or a have a U.S. mailing address. A winner will be chosen on July 30, 2012! Good luck! Book Blogger Hop! Let's hop! A hug for all of you!